A specialty of the Bavaria region of southern Germany, drenched in gravy these famous SemmelKnödel (German Bread Dumplings) are pure heaven! These Semmelknödel (Bavarian potato dumplings) have always been a favorite mine. 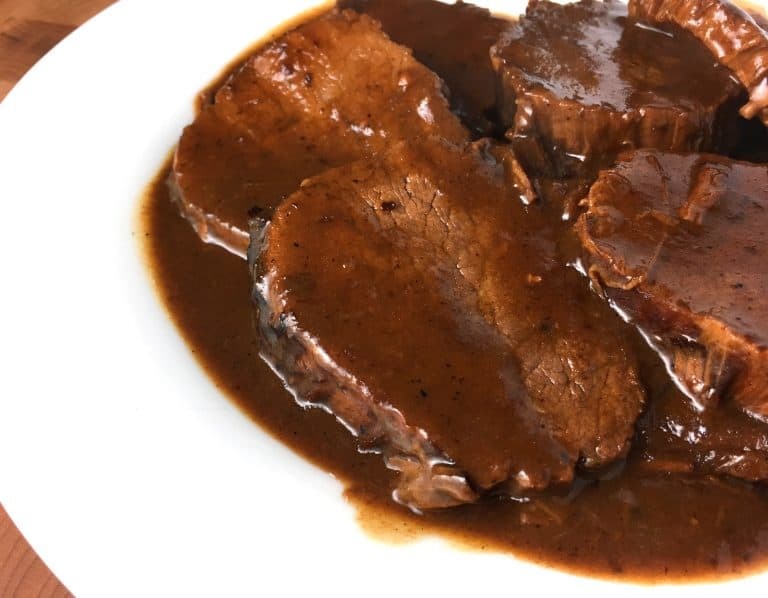 It doesn’t matter what they’re served with – drenched in gravy they’re pure heaven! Semmelknödel (also called Klöße) are a specialty of the Bavarian region of Germany. My mother is from Bavaria, a favorite family vacation destination from where I grew up a little further north in Swabia. My mom also spent several years of her childhood in Thüringen (Thuringia) where the other famous German dumplings come from: Kartoffelklöße (potato dumplings) – (recipe coming soon!). Both kinds of dumplings are exquisite and I grew up with my mom and Oma cooking both kinds. Today we’re featuring the former, Bavarian Semmel Knoedel. 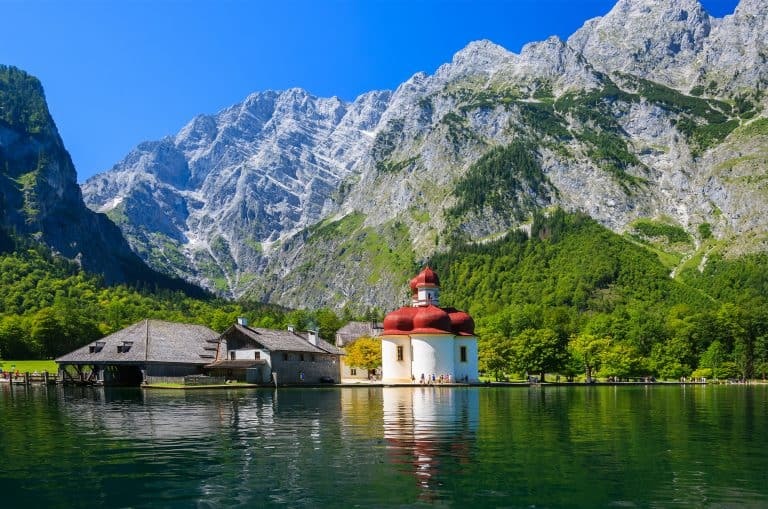 Beautiful Königssee in the Berchtesgarden region of Bavaria, where I spent many summer and winter vacations. 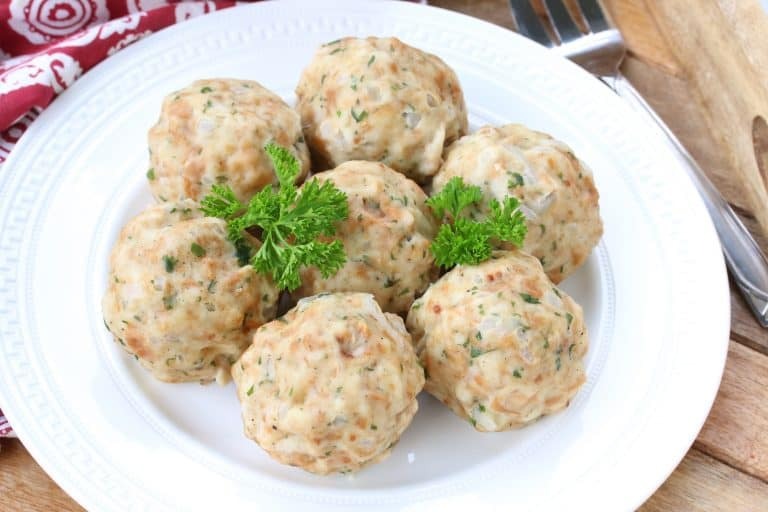 The Semmel Knoedel recipe is pretty standard: Diced hardened bread rolls, onions, butter, fresh parsley, milk, eggs, salt, pepper and often a dash of freshly ground nutmeg. 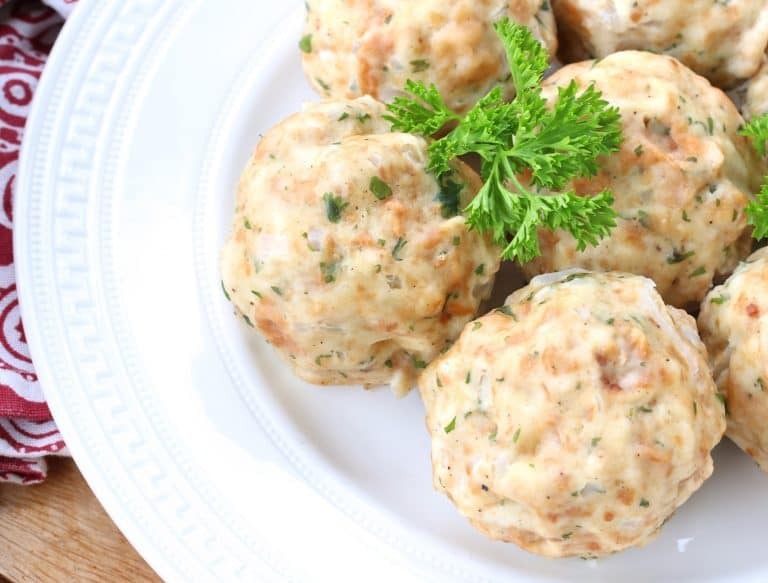 Another variation, Speckknödel (bacon dumplings), are prepared exactly the same way only they have the addition of cooked bacon. That option is included in our recipe. German Semmel Knoedel are easy to make and they also freeze well, so I like to double or triple the batch, cook them, freeze them separated on cookie sheets, and then transfer them to ziplock freezer bags. Then when I need them all I have to do is thaw and reheat them covered in the microwave. They’re as good as new! Let the rolls/bread sit out for a few days until hard. Chop the hardened bread into small cubes and place them in a large bowl. Pour the hot milk over the bread, cover, and let sit for 20-30 minutes or until softened. Heat the butter in a frying pan and cook the onions just until transparent, do not brown them. Add the cooked onions to the bread mixture along with the eggs, cooked bacon (if using), parsley, salt, pepper and nutmeg. 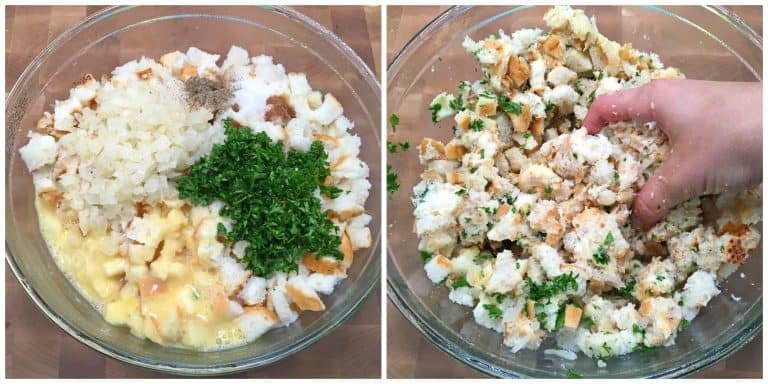 Knead the mixture together with your hands until very thoroughly combined, breaking up as many of the bread cubes as you can until it’s a soft and chunky-smooth consistency. If the dough is too wet, add breadcrumbs (not flour). Wet your hands to prevent the dough from sticking and form Knödel about the size of a tennis ball (they will expand slightly when cooked). Press the Knoedel between your palms to make sure they’re nice and compact. Bring a large, wide pot of lightly salted water to a very light simmer – not boiling but just on the verge of boiling with lots of tiny bubbles floating up. Carefully drop the Semmel Knoedel in the water and let them lightly simmer for 15-20 minutes. 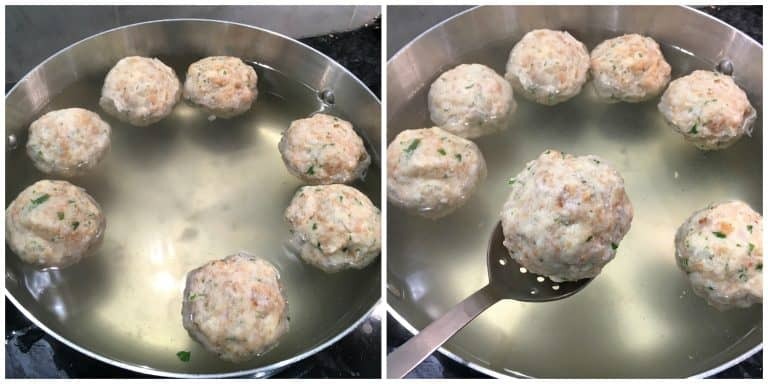 Do not at any point let the water boil or you risk your Knödel losing shape or falling apart. Carefully lift them out with a slotted spoon. To Freeze The Semmelknoedel: Let them cool completely, place them spread apart on a cookie sheet and freeze them, then transfer them to a freezer bag or container. To reheat, let them thaw and reheat them covered (to create some steam) in the microwave. Makes 6-7 Semmelknödel, depending on the size. 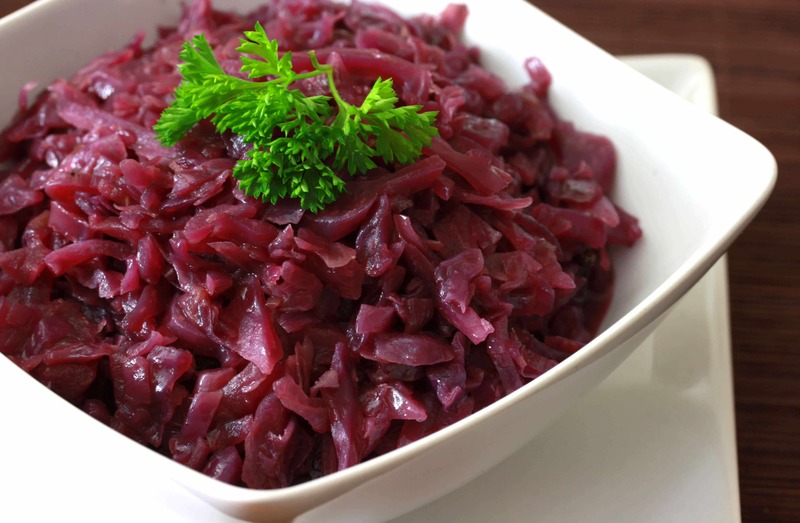 …and of course you can’t have Sauerbraten and Knödel without Homemade German Rotkohl! A specialty of the Bavaria region of southern Germany, drenched in gravy these SemmelKnödel are simply heaven! Serve them with beef or pork roast, any kind of sauce/gravy, goulash and more! 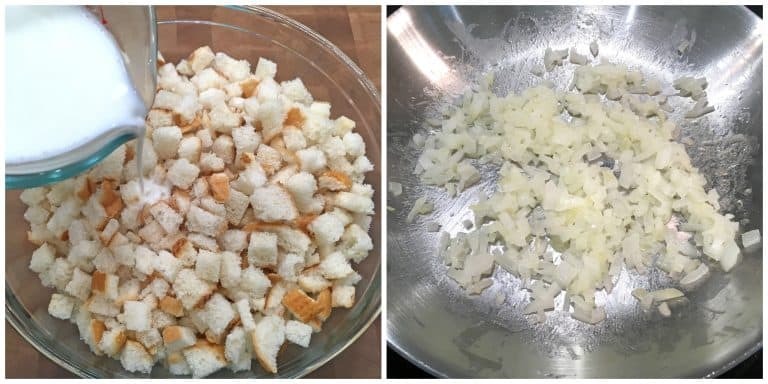 Chop the hardened bread into small cubes and place them in a large bowl. Pour the hot milk over the bread, cover and let sit for 20-30 minutes or until softened. Heat the butter in a frying pan and cook the onions just until transparent, do not brown them. Add the cooked onions to the bread mixture along with the eggs, cooked bacon (if using), parsley, salt, pepper and nutmeg. 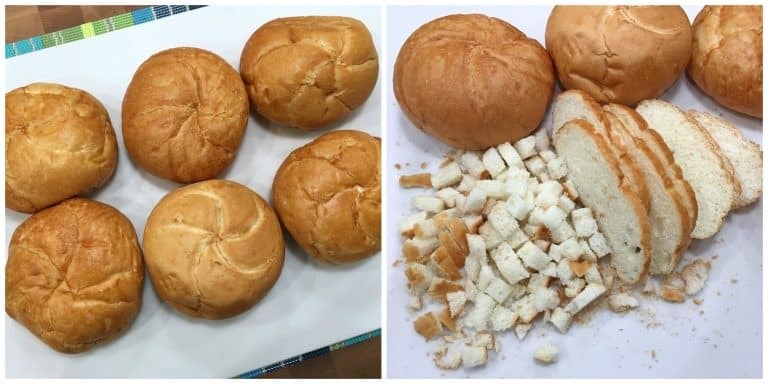 Knead the mixture together with your hands until very thoroughly combined, breaking up as many of the bread cubes as you can until it's a soft and chunky-smooth consistency. If the dough is too wet, add breadcrumbs (not flour). Wet your hands to prevent the dough from sticking and form Knödel about the size of a tennis ball (they will expand slightly when cooked). 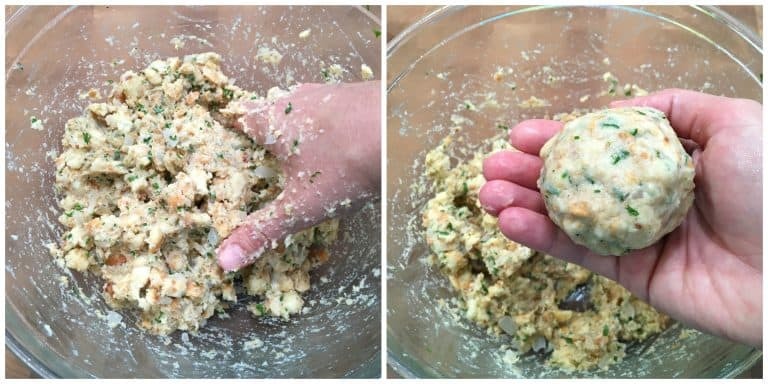 Press the Knoedel between your palms to make sure they're nice and compact. Bring a large, wide pot of lightly salted water to a very light simmer - not boiling but just on the verge of boiling with tiny fizzy bubbles floating up. Carefully drop the Semmel Knoedel in the water and let them "steep" 15-20 minutes. Do not at any point let the water boil or you risk your Knödel losing shape or falling apart. Carefully lift them out with a slotted spoon. 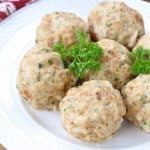 To Freeze The Knödel: Let them cool completely, place them spread apart on a cookie sheet and freeze them, then transfer them to a freezer bag or container. To reheat, let them thaw and reheat them covered (to create some steam) in the microwave. Seeing those photos of the Königssee made me long to return. My mother was born and raised in Bad Reichenhall and this is less than 30 minutes away. 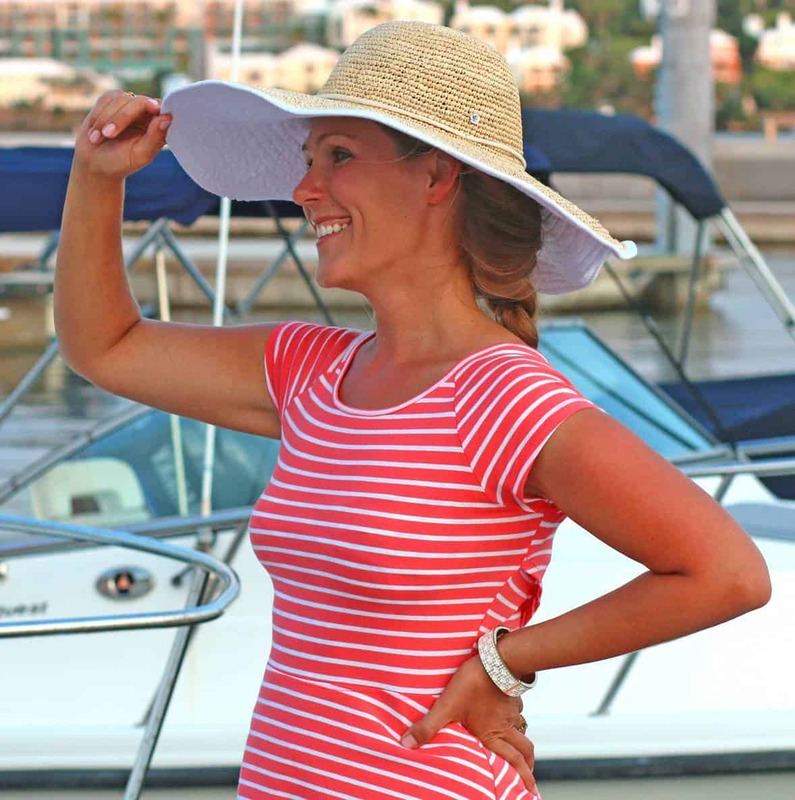 We were just there in April and, sadly, a freak wind storm hit so the boats wouldn’t go out on the lake. My Mutti taught me to make many of the recipes that you share. None of them were written down, but many are simply in my memories of making them with her. I am so excited to see when you post potato dumplings. They are my favorite and that’s one thing my Mutti never made from scratch! She made them from Panni. I’d love to learn how to make them from scratch! Danke! My husband loves German food. I’m totally making these for him! Thanks! I am so curious to try these! I bet they are amazing with schnitzel! These look so comforting and delicious! Yum! I have never heard of these! I won’t attempt to try and spell them… I’ll just refer to them as bread dumplings. What a delicious addition to dinner! I LOVE German food. This is absolutely fantastic! So YUMMY! Is good food and this looks like one of the BEST! I love a good authentic German recipe. These look amazing! These look so delicious, and I bet they would be perfect with any type of meat and gravy. Yum! This sounds amazing! Thank you for this recipe! I love that these dumplings are made of easy to find ingredients! Yum! I have never heard of these before. I always love trying new things. I will be giving this a try this fall. These would be a great addition to add some flare to our holiday table. These sound delicious right about now! These would disappear in our house! Hi Kimberly! My Mom used this recipe to stuff her roasted chicken on Sundays and now I am using it for my turkey stuffing. She was from Bavaria. Turkey gravy and this bread stuffing is delicious! I love all your recipes and many take me back to my child hood. WOW… the minute I saw that picture I knew I just have to make these !! and I’m so looking forward to your posting the recipe for Potato dumplings and your favorite Rouladen. Thank You for all your wonderful recipes ! 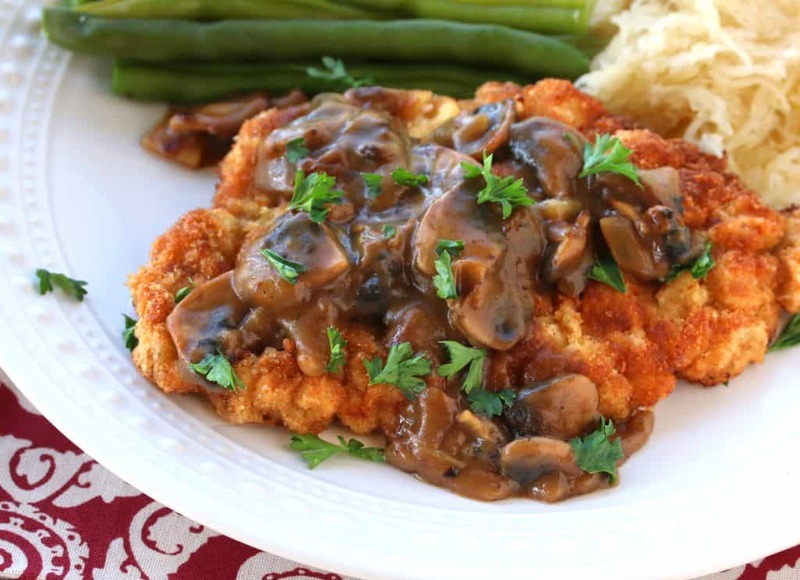 I made these for a small gathering last night with your Jaegerschnitzel recipe (SO good!!) and I was surprised how easy they were to make. I’ve also bought the pre-made ones in the past. 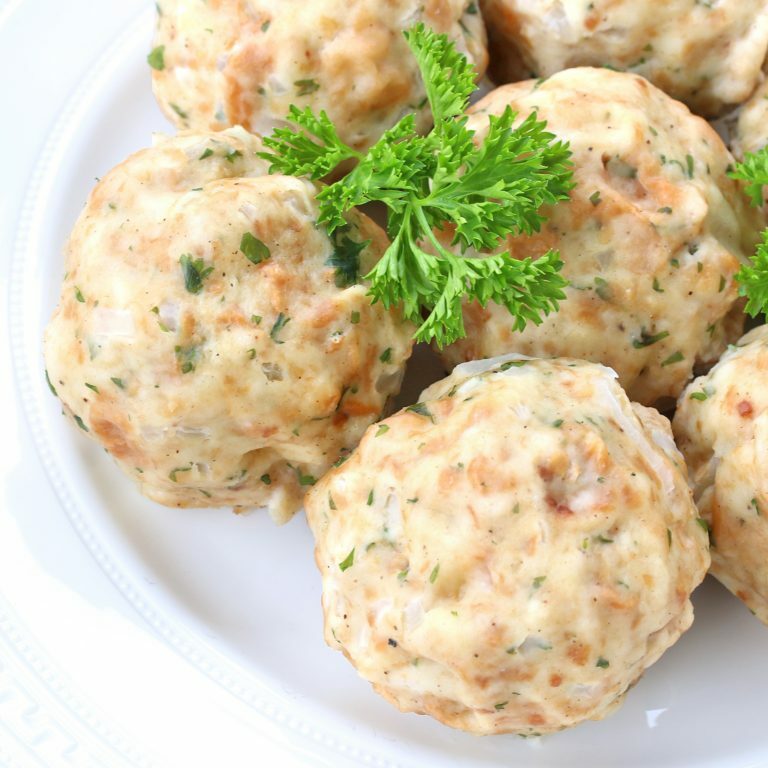 These knoedel are absolutely delicious, so much better than the ones from the store! I’ll follow your suggestion to make a double or even triple batch next time and freeze them. I love all of your recipes, Kimberly, and this one was another winner. Thank you for sharing your talents! Hi Robert, I’ve heard of pigtails used in soups and stews but roasted pigtails is a new one to me. Ach du meine Güte. Siedendes Wasser meine ich, der Zustand kurz vor dem Kochen. This is the same recipe I use as stuffing for turkey, minus the nutmeg. It is how my mother and grandmother always made stuffing. There was never a recipe; we just learned by watching when we were young. Over the years, I’ve started using a lot more parsley than your recipe calls for; that’s just a matter of personal taste (I love parsley!) My family loves this stuffing; I’d be disowned if I tried to make a different one. I’ve never known anyone else to make this type of stuffing, so it was very satisfying to read your recipe. I’m looking forward to trying this recipe as dumplings; I never would have thought to do that. Thank you! Hi Chris, using this as a turkey stuffing is a great idea. 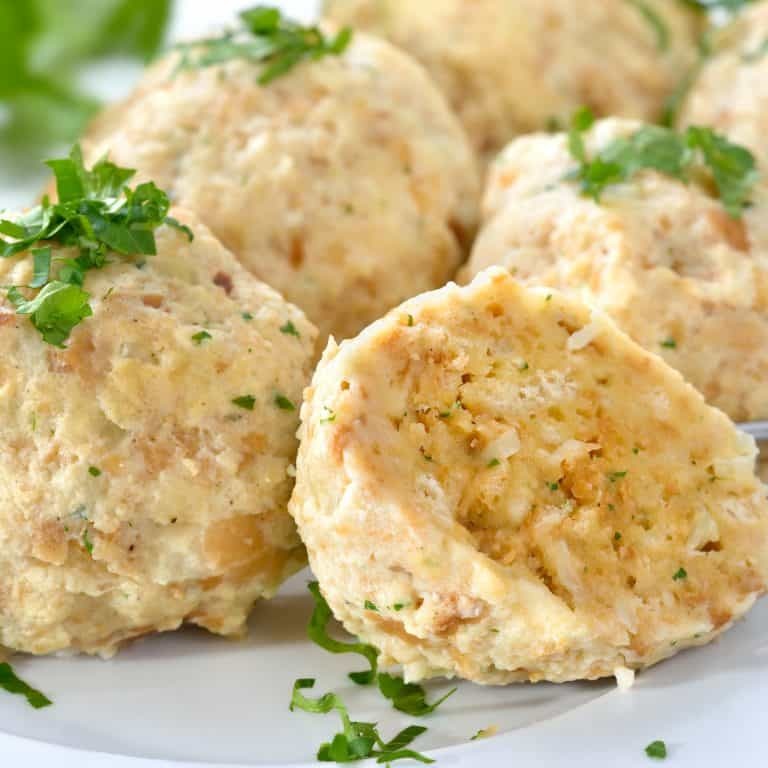 I think you’ll really enjoy these Semmelknödel dumplings! My wife is German, so I am going to surprise her soon with some of these dishes. When we traveled through Germany with her aunt and uncle some 40 years ago, we stopped for lunch at a small hotel in south-western Germany and were served homemade Swabian Maultaschen. It was absolutely wonderful and one of the best things we tried on the whole trip. I am looking forward to your recipe as I haven’t been able to find one in the cookbooks I have. What a great surprise, Jerry, and a wonderful act of love! Maultaschen is one of my all-time favorites. I keep meaning to post my recipe for them and just haven’t gotten around to it yet. Hopefully soon. Thank you and happy cooking! This is the same Brotknoedel rezept I learned from my Tante. I also larned to add a little club soda to my Spatzel ( and a pinch of Muskat) for use with chicken gravies. I would also like to see a Maultaschen rezept. I have one from my Tante Resi who was cloistered in WW ll and learned from die Scwestern near Friedrichshafen. Don’t forget a few dashes of Maggi to top it off. Every time I am in Germany I buy more cookbooks ( mostly from Schwaben) and cook like a crazy person when I get home. I am going to follow you so I can remember what my favorite dishes are supposed to look like. Schmekt mir gut! Danke! As I was reading your comment-(19 October 2018@2:01pm. )- you actually brought back many great memories, had a tear in my eye !! Happy ones, of course !! Mein Vater u. Mutti sind Deutsch. I have is so old .. was passed down from many generations, (all I know by heart) , just making sure I was doing it correctly, since it’s been awhile when I made these. I instantly became speechless when I read you wanted a recipe for Maultaschen , I also add a bit of club soda to my Spazle !! Friedrichshafen is what has gotten to me !!! “ I sprech Schabish… Du Au ???? Years ago the officer’s club in Norfolk, VA. had a theme night every month and that was my introduction to German food. I thoroughly enjoyed it and wish there were more German restaurants but thanks to you I can make it myself!! Yay!! 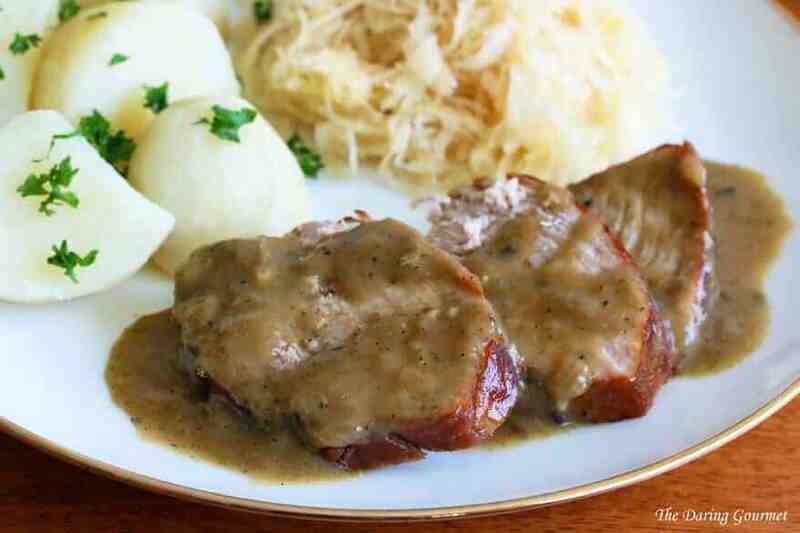 Nothing beats homemade German food, Judy, I hope you enjoy it! Been waiting to see your recipe. Almost identical to my cousin’s which are fabulous and I’ve made evral times. Will try this version. 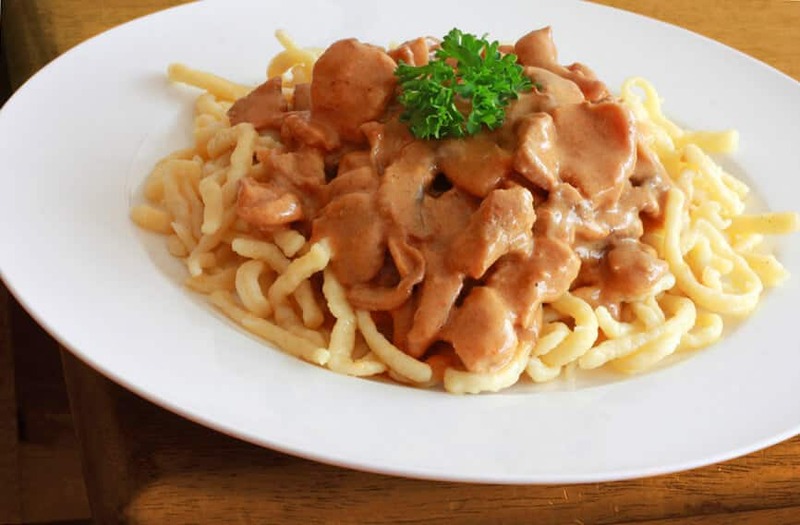 I love the Bavarian and Swabian fare, so hearty and tasty. Swabian and Bavarian are the best, Paul! But then being a “southerner” I’m also biased ;) Happy cooking and guten Appetit! My grand mother and her sisters tried to make the marrow dumplings for the soup that was served on every thanksgiving that their mother (my great grandmother) made every year, till Grossie passed away. It took them over 4 years to get it right. One year, they floated away to nothing; the next year they were so hard if you threw them they would bounce; the next year if they were thrown, they nicely stuck to the wall. The 4th year, they finally got the recipe and cooking right. My gram and her sisters are gone now – have been for over 40 years. But Gram wrote down both of the recipes for the soup and the marrow dumplings. So now my cousins and I make it every Thanksgiving. Thank you for your recipe. It is one that I am planning on keeping. CAME OUT PERFECT AND SO DELICIOUS!! I can’t tell you how excited I was to find this recipe and now absolutely elated that they were such a success! Next time I’m tripling the batch so I can freeze a bunch. Thank you for this fantastic authentic recipe! My Oma and Opa, Tante and Onkle, and my first generation German/American parents, shared their German traditions and delicious cooking while we were growing up. Your recipes bring back wonderful memories of childhood Sunday dinners at 2:00! I just finished making a double batch – ein Semmelknodel, und ein Speckknodel. My kitchen smells amazing and I can’t wait to taste these beauties that will grace our Christmas table tomorrow afternoon, along side of your Sauerbraten recipe! Danke! Danke! I have made these twice now very delicious . Tastes just like my Omas Knödel ! Fantastic, Rebecca, thanks so much! Thank you for the tips, Susanne! That’s fantastic, Monika, I’m so glad you enjoyed both recipes, thank you! And what is up with those restaurants?? So glad you found our site, thanks again!